Seed Bead Revolution is available for order through Amazon and SoftFlexCompany.com. The seed bead sector of the jewelry making industry is churning out new shapes and sizes of seed beads with a variety of hole configurations. Authors Sara Oehler and Kristen Fagan wrote this book to show how these new and innovative beads can be used to create jewelry using Soft Flex beading wire rather than thread or cord. The projects are easy to intermediate, but they are unique enough to capture the interest of even the most advanced beader. Most projects can be completed in one sitting. Projects use SuperDuos, SuperUnos, Tilas, Half Tilas, Rullas, Dragon Scales and More! 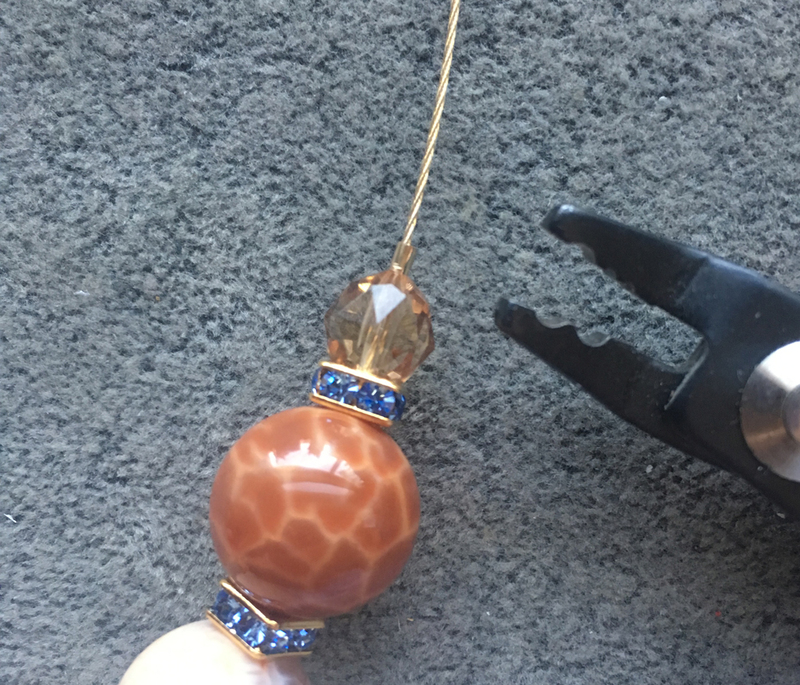 Learn how to crimp in a variety of ways, braid, kumihimo, patina metal and weave with beading wire. Can I just tell you how excited I am that our book, Seed Bead Revolution, has finished shipping pre-orders! After three printed proofs and multiple edits, Sara and I finally signed off on the final Seed Bead Revolution and the pre-orders are on their way to Soft Flex Company headquarters in California to be shipped. We can’t wait for you to receive your pre-order copies! Thank you so much for those of you that already placed your order. We are excited to see the designs you create. 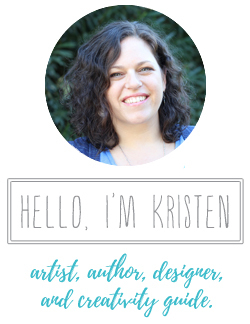 I hope you share your projects and the arrival of your books in the mail with me! Use the hashtag #seedbeadrevolution on social media for me see your images. 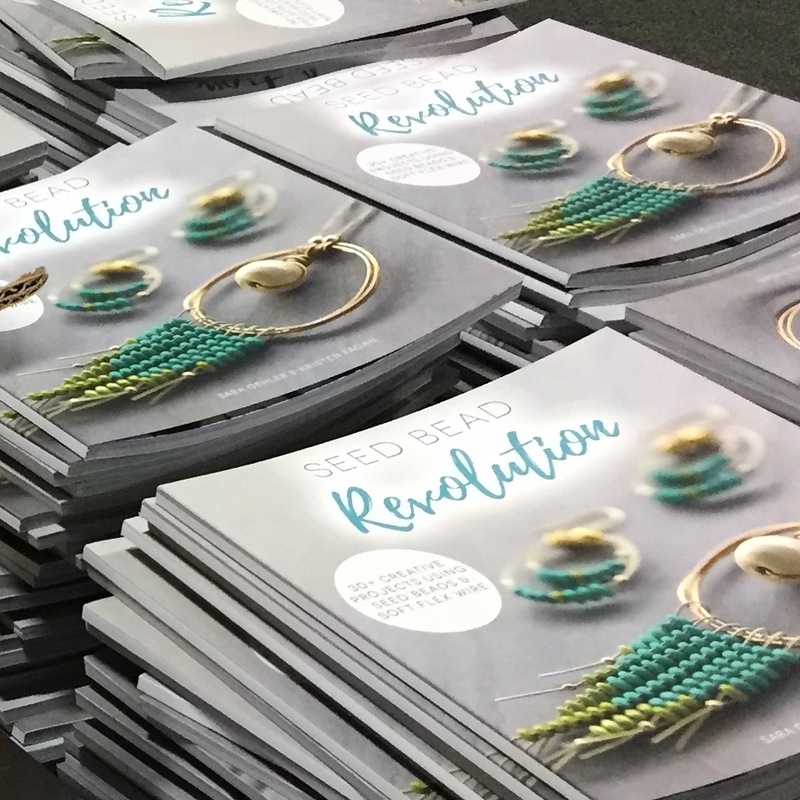 Seed Bead Revolution Available for Pre-Order! I co-wrote and designed a BOOK! This is pretty exciting stuff. Who would have thought I would collaborate with the magnificent Sara Oehler and write a beading book?! Not this girl. 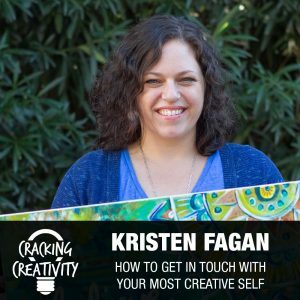 Sometimes you have to say yes and just jump into creating something awesome! The printed proof arrived in my mailbox this week! I’ve been ooo-ing and aah-hing and of course editing and a little file tweaking on this baby. Sara should be getting her copy any day now. Seed Bead Revolution is available for pre-order through SoftFlexCompany.com through July 31st. 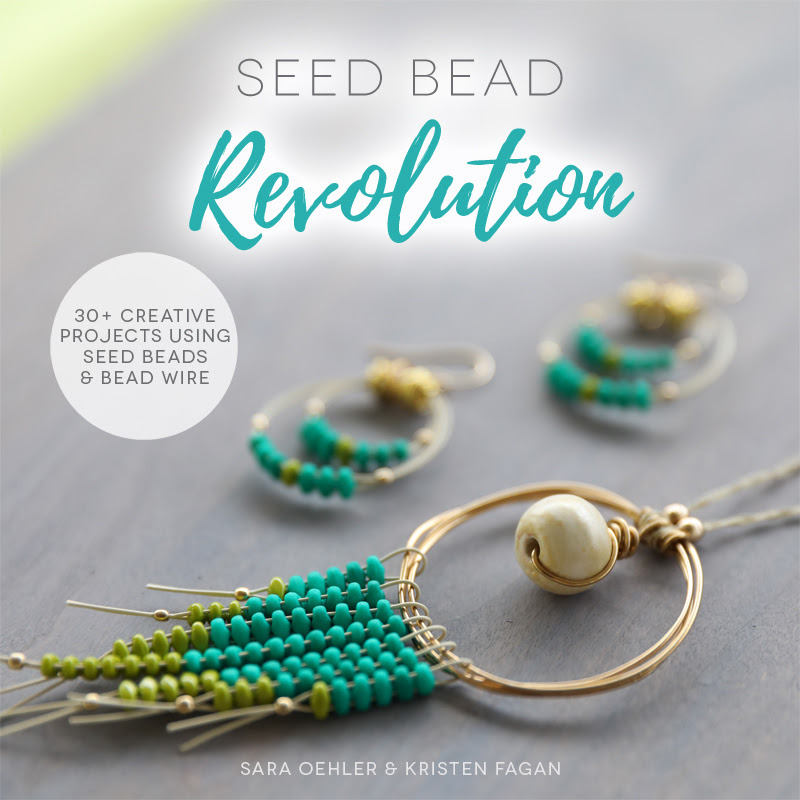 Pre-order books will be signed by Sara Oehler and I and include two full project sneak peeks from Seed Bead Revolution in a digital PDF format that will be sent to you via email shortly after purchase. That will allow you to get a head start on two projects from the book even before the book ships! Thank you so much for those of you that already placed your order. It’s on schedule to ship out next month. We are excited to see the designs you create. I hope you share your projects and the arrival of your books in the mail with me! Use the hashtag #seedbeadrevolution on social media for me see your images. 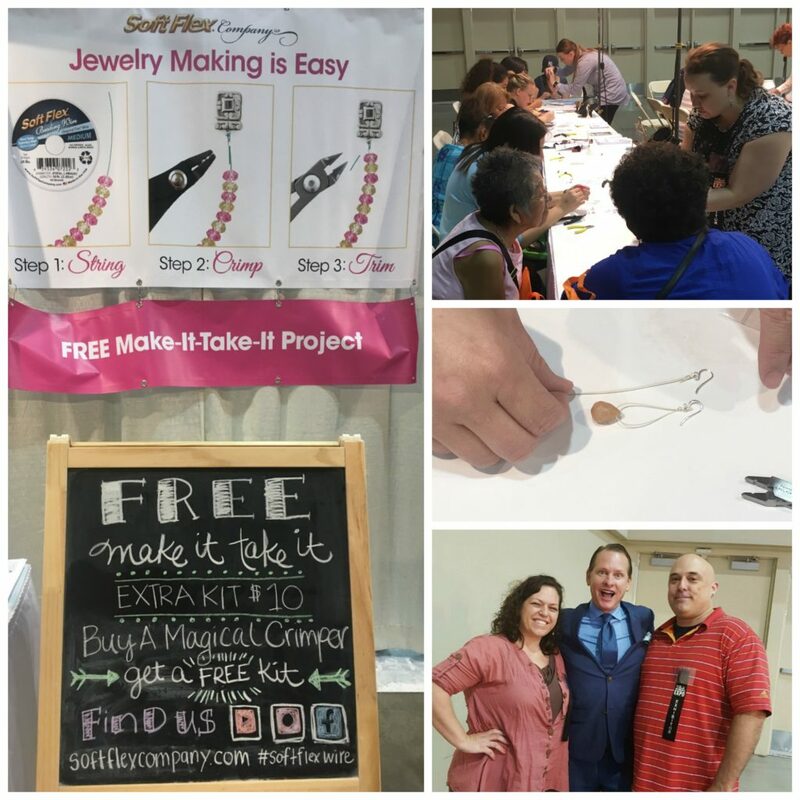 Sara, Thomas, Lucy, Josephine, Leeann and I had fun in the Soft Flex Company booth teaching hundreds of people how to make their first pair of earrings at the Arizona Ultimate Women’s Expo in Phoenix! Bonus, Thomas and I got to meet Carson Kressley!!! I really should have paid attention to the keynote speakers before I went because, had I known, I would have brought my (ahem, Bert’s) Queer Eye of for the Straight Guy book to sign. Sara said I was the most excited she has ever seen me. Hahaha, I’m not sure if that is true, but I was pretty excited. If you would like to learn how to bead, visit Soft Flex Company’s School of Design online or their YouTube channel for hundred’s of tutorials. My friend Sara really captured how pretty the cranes are in this picture! 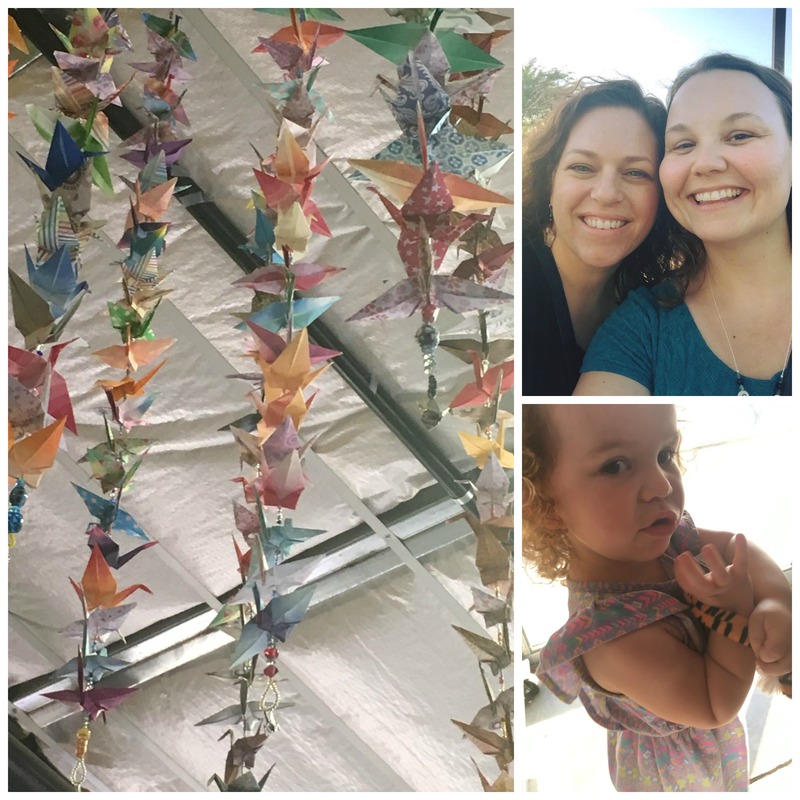 So happy I drove down to Tucson with her and her adorable daughter on April 19th to see the Beads of Courage 1,000 Origami Crane Art Installation debut. 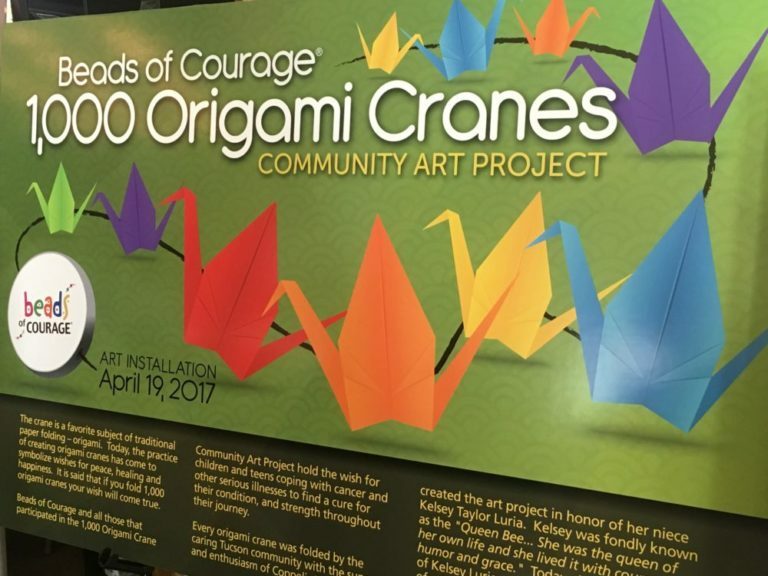 The 1,000 Origami Cranes community art project was conceived by Tucson resident Coppelia Tarantal, whose niece, Kelsey Luria received Beads of Courage during her treatment for Acute Myeloid Leukemia. 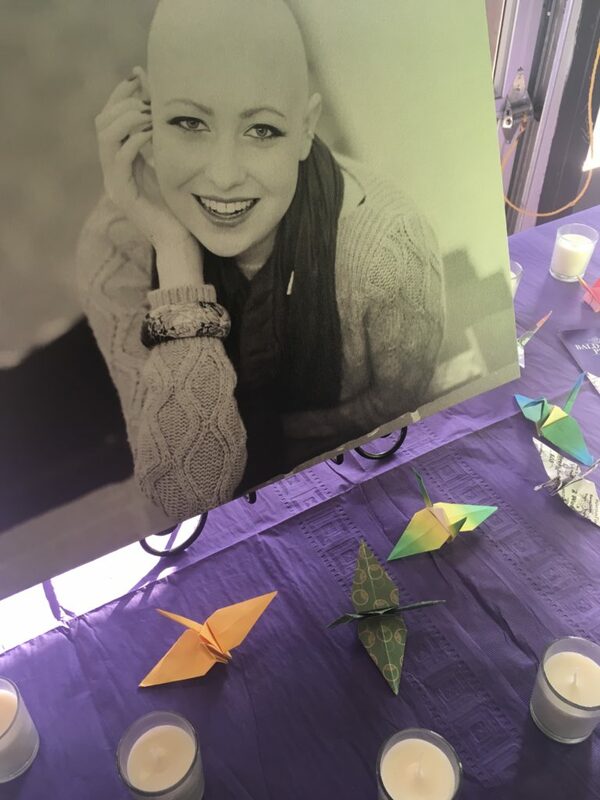 Although Kelsey left her battle with cancer, her spirit, legacy and desire to positively impact the lives of children and teens with cancer lives on. 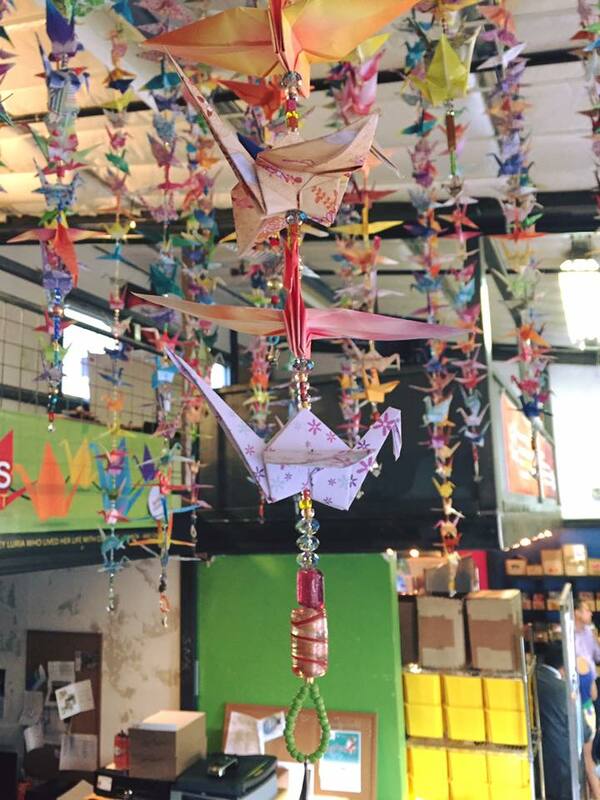 The 1,000 Origami Cranes project celebrates Kelsey’s life and the lives of all children and teens coping with cancer and other serious illnesses. Japanese folklore suggests people with patience and commitment for such a project will be granted a wish. Support for the project was proudly provided by Soft Flex Company with their generous donation of beading wire and tools to create the display of origami cranes. 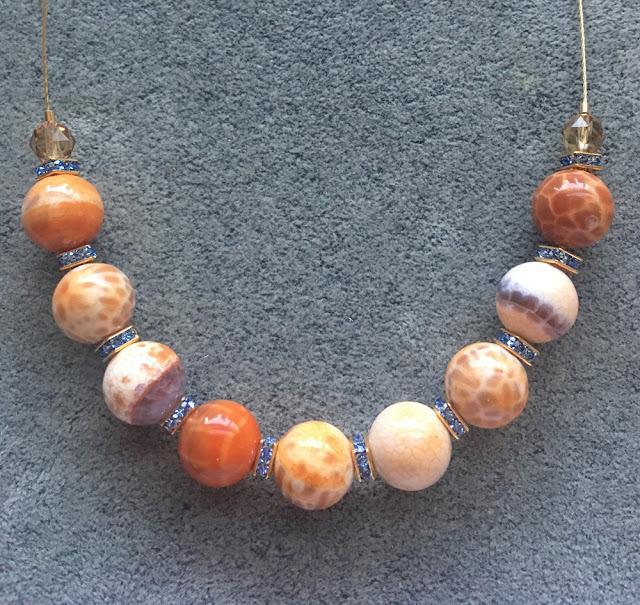 Beads of Courage is a 501(c)(3) nonprofit organization founded in Tucson in 2005. Its mission is to provide innovative arts-in-medicine programs that improve the quality of life for children coping with cancer and other serious illnesses, their families and the clinicians who care for them. The organization serves 60,000 children in 250 children’s hospitals annually. For more information, visit beadsofcourage.org. About Kelsey Taylor Luria: Kelsey was 17 when she was diagnosed with Acute Myeloid Leukemia (AML). “I am more than cancer” – she wrote, and indeed, Kelsey was far more than cancer. She was the queen of her own life and she lived it with courage, strength and grace. She lost the battle against AML after 5+ months. Shortly after her death, Kelsey’s family brought her vision of the Bald Beauties Project to fruition. Bald Beauties Project provides funding for AML research, and provides professional photo shoots, and Teen Comfort Kits for pediatric oncology patients in Southern Arizona. For more information, visit http://baldbeautiesproject.org. I finished, I Finished, I FINISHED! Woot Woot!!! 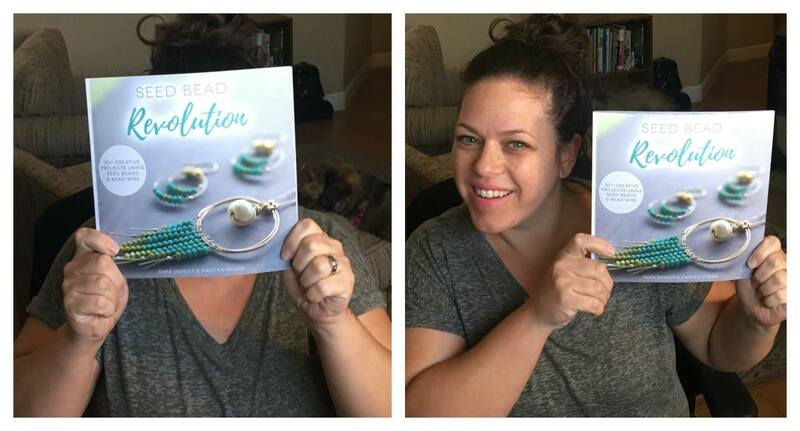 I’m sooo excited that I finished all my jewelry instructions for the book “Seed Bead Revolution” I’m working on with Sara Oehler! A big project that has had me beading all day and night is a beading how-to book I’m co-authoring with my friend Sara. I completed my 16 beading designs and we photographed all 32 projects this Friday. Here’s a sneak peek at one of my design sets that will appear the book – squeeeeeee! 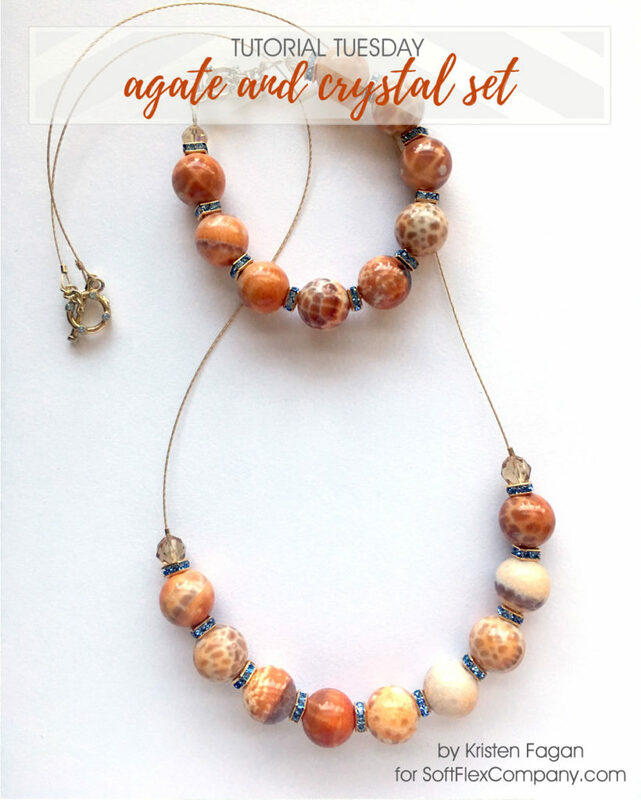 You can easily make this necklace and earring set. Seriously. 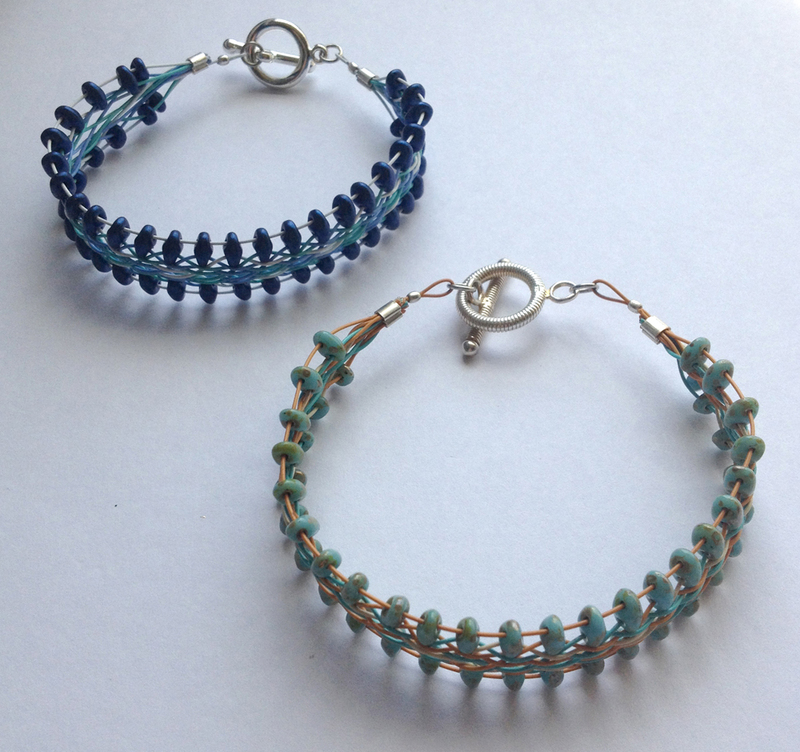 Bracelet Design Tutorial Published in Beadwork! I am so excited to finally be able to share this design with you! 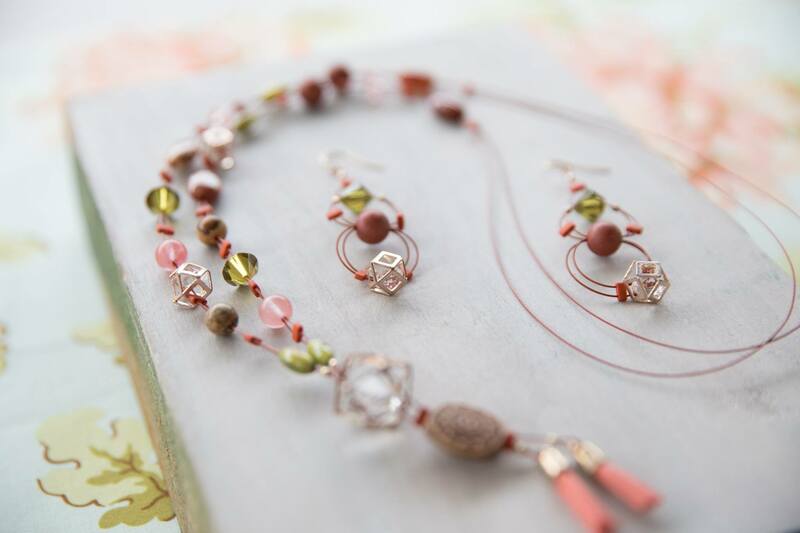 It’s my debut jewelry tutorial project design with Beadwork magazine. 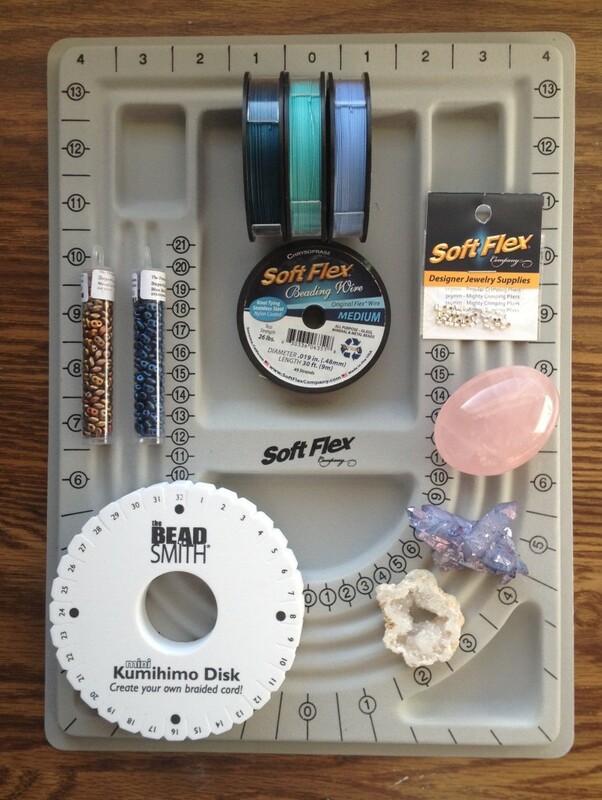 I love that it is showcasing how to use Soft Flex beading wire in a non-traditional way – with Kumihimo! 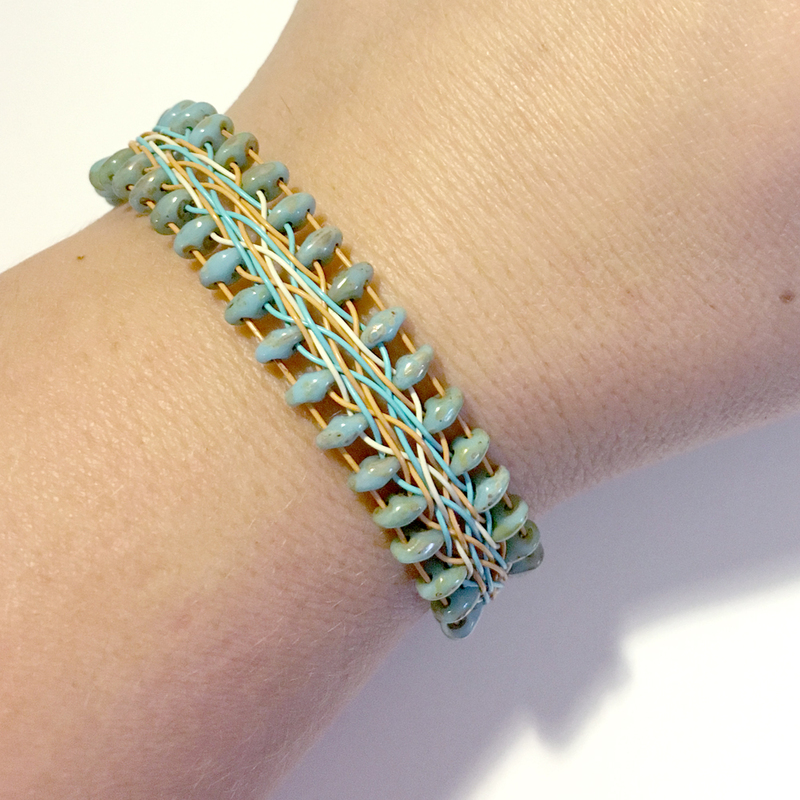 This design uses a flat braid pattern made with the square kumihimo plate combined with superduo two-hole beads. I just love the elegant look of the braided wire and the flat braid is so comfortable to wear. 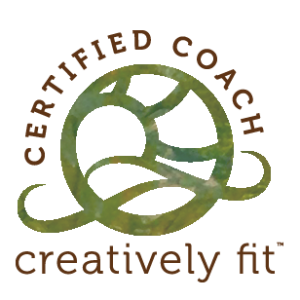 If you get a chance, I hope that you will check it out and give it a try! Do you ever wish you could walk through life with the knowledge that you are protected? That you sense an invisible shield around you, keeping negativity at bay and amplifying more of the positive energy you want to embody? I want that too! 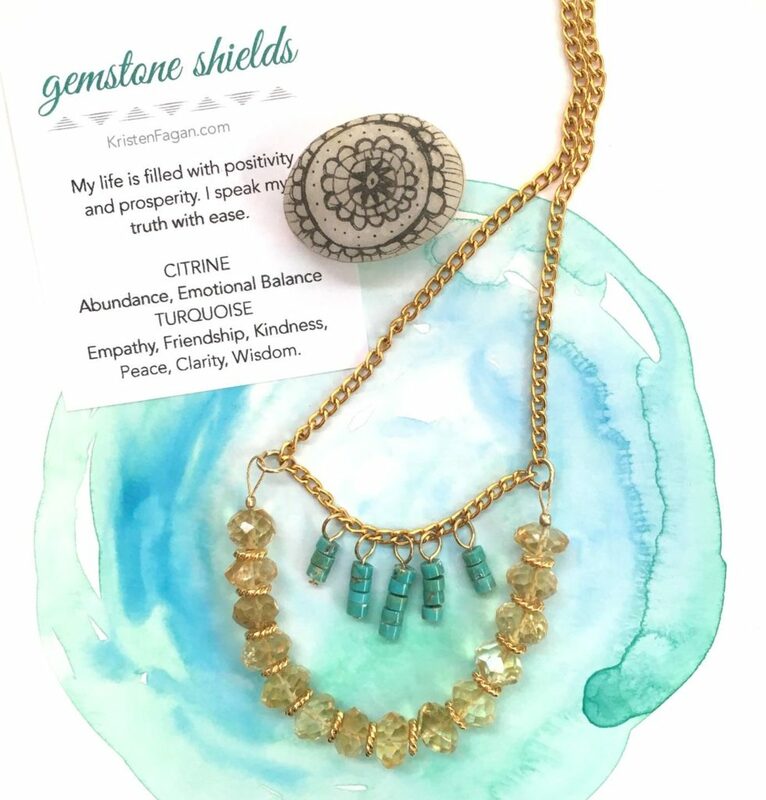 I believe in the power of gemstones and created the gemstone shield necklace collection as a beautiful way to support you so you feel confident to walk boldly in the world. 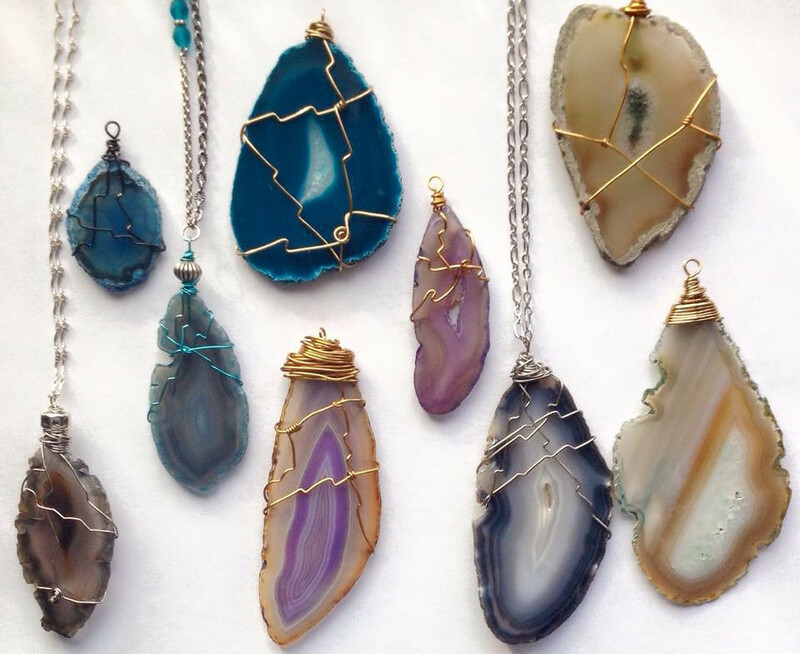 Gemstones emit vibrations that that can aid the wearer in different ways. 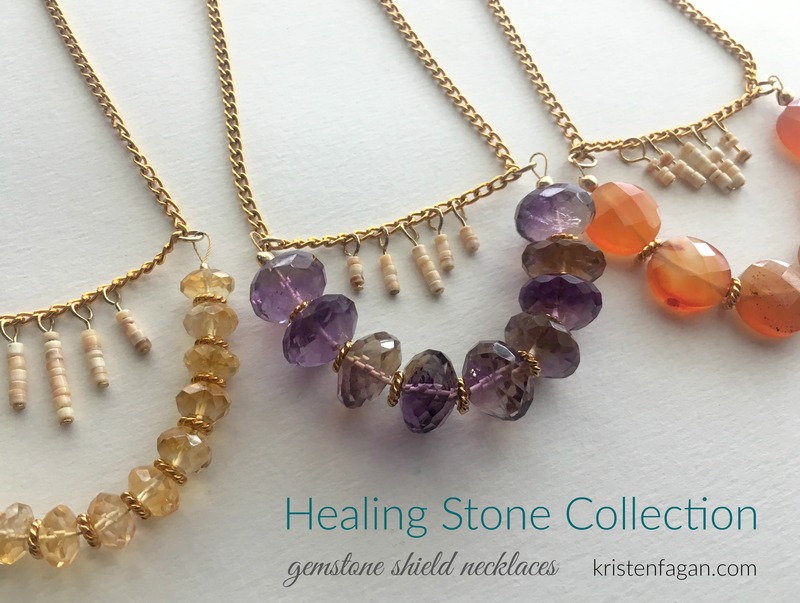 Each stone’s unique composition infuses it with powerful energy that can be utilized for specific purposes, such as to protect, heal, release spiritual blockages, energize, provide mental clarity, and more. 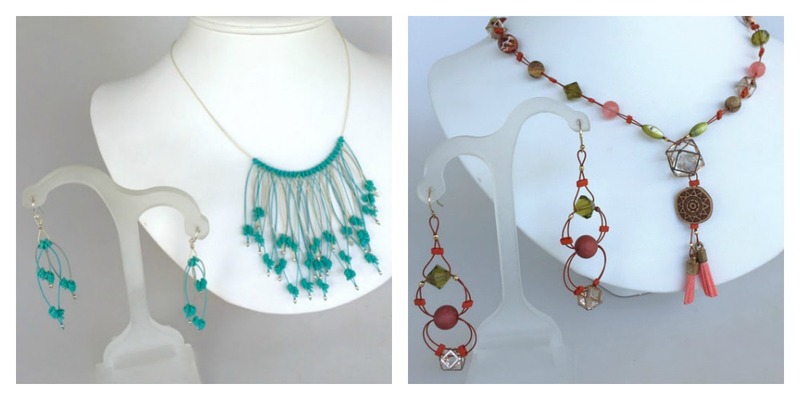 Click to see the collection and the energy each necklace embodies. 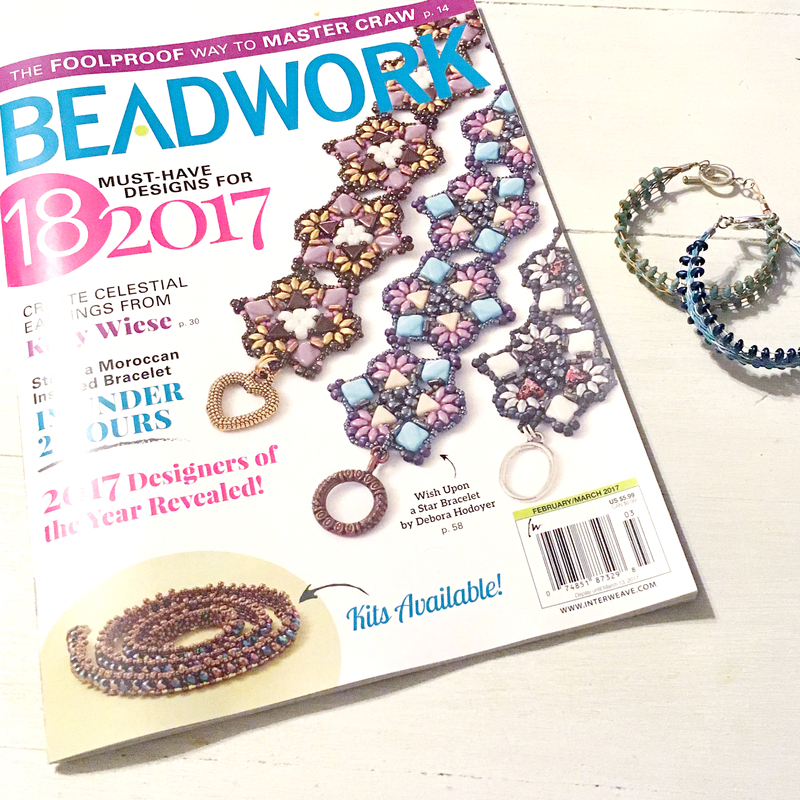 February buzzed along with excitement in my corner of the beading world. I can’t believe it was a month ago that I was down in Tucson for the Tucson Gem, Mineral and Fossil Show. I was at the To Bead True Blue show for two days working with Soft Flex Company. This an international gem, mineral and fossil showcase and it’s mind-blowing how many vendors are crammed into every corner of Tucson. There isn’t just “one show” there are many shows of varying types in convention halls, hotels, motels and parking lots around the city. I have lost count as to how many times I have been there however, this is the first year I branched out and purchased some stones and I LOVE them. 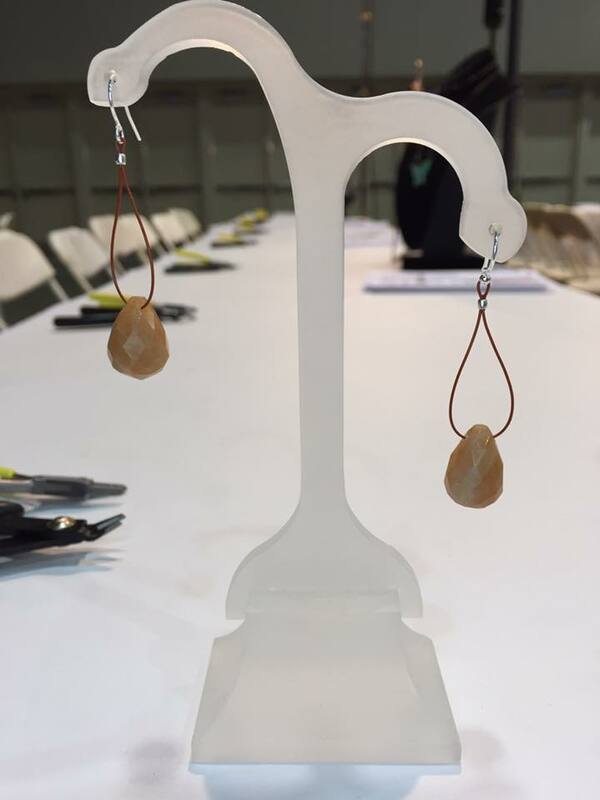 Since I go to work in Soft Flex Company’s booth, you’ll find me at the beading/jewelry making oriented shows which have a limited range of minerals and stones. I did manage to find a really pretty tanzanite aura quartz, a smooth rose quartz and a small geode slice that I plan to make into a pendant, all shown in the picture above. Of course, I can’t leave the Soft Flex booth without picking up some much needed jewelry making items. 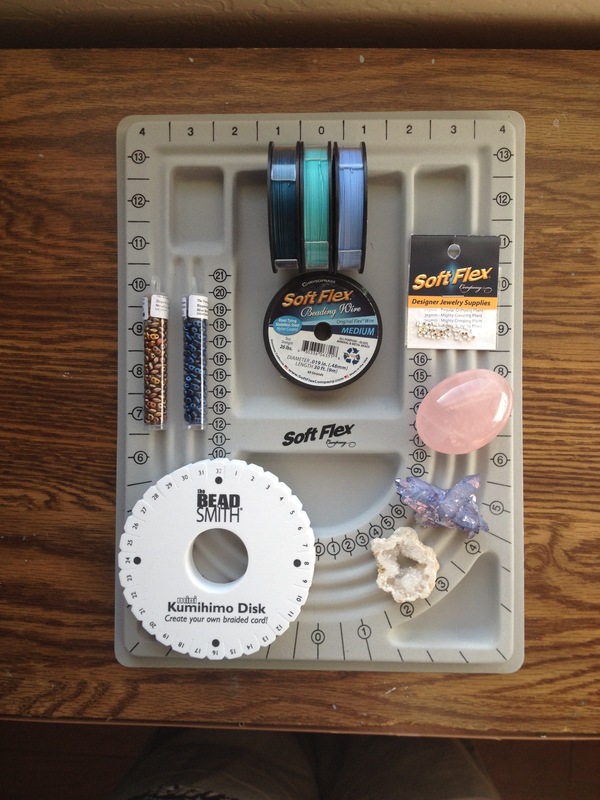 I grabbed a new bead board as mine has seen better days, 4 spools of medium .019 diameter colored Soft Flex beading wire, 2mm silver filled Soft Flex crimp tubes, double density round kumihimo disk and two tubes of superduo beads. 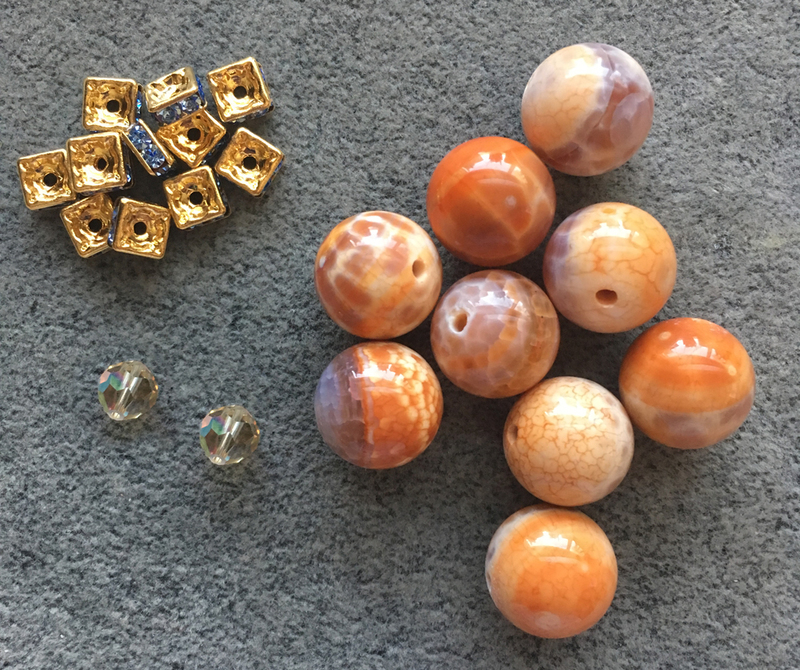 Speaking of superduo beads, I used these little two hole beads for a new jewelry tutorial design that was picked up by a national beading magazine! I’m in the process of writing out the instructions and working on a second color option. I’ll share more about that when the magazine is due to come out! Reg: $11.95 – on sale through the end of the year for just $9.56! 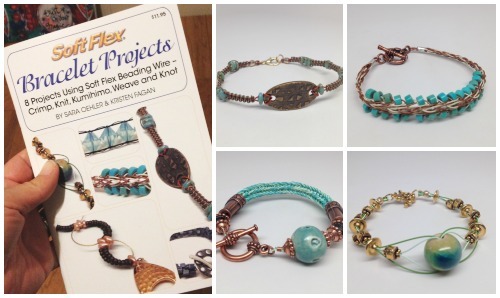 I have been providing how-to jewelry tutorials on Soft Flex Company’s beading blog and website for years but, I took it up a notch and teamed up with my friend Sara Oehler to co-author a DIY bracelet project booklet. Inside Soft Flex Company’s Bracelet Projects booklet you will find 8 modern bracelet designs using Soft Flex beading wire. 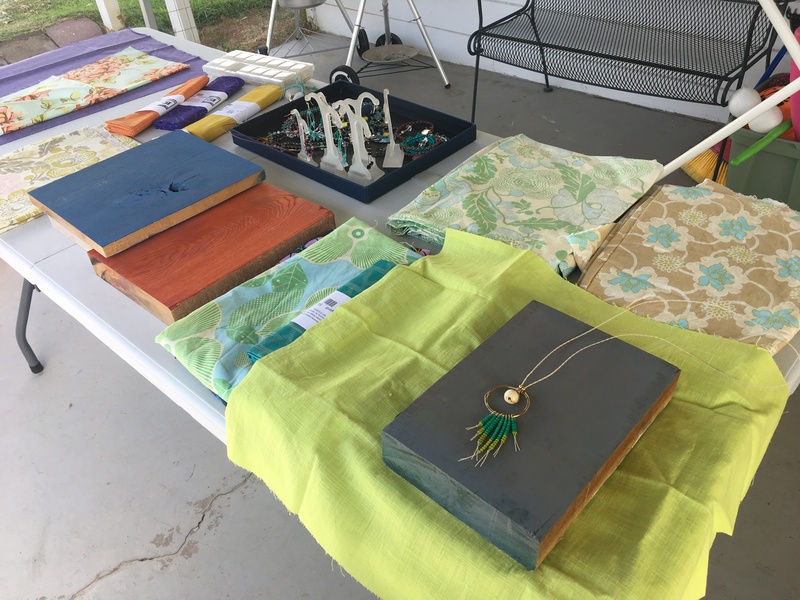 You will learn about beading wire brands, diameters, crimps, crimping pliers, kumihimo boards, macrame boards and knitting on a spool. This is a great book for a beginner or an advanced beader that is looking to take their beading in a new direction. 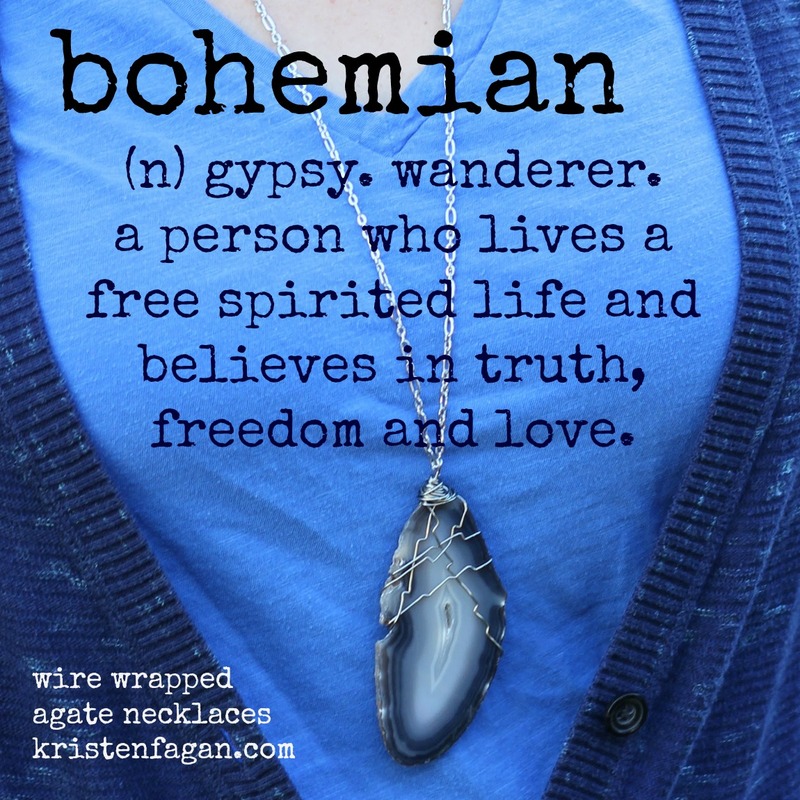 An outfit is never fully put together without some finishing touches – a hand wrapped wire and agate pendant necklace is the perfect finishing touch for the gypsy, goddess, free spirited, bohemian woman. 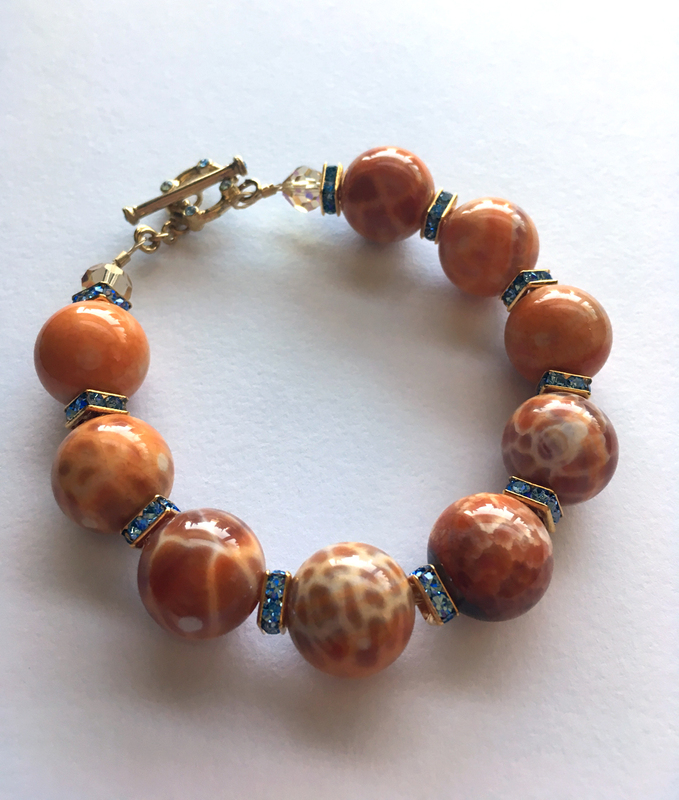 Brazilian agate balances the four energies: physical, mental, emotional and spiritual. 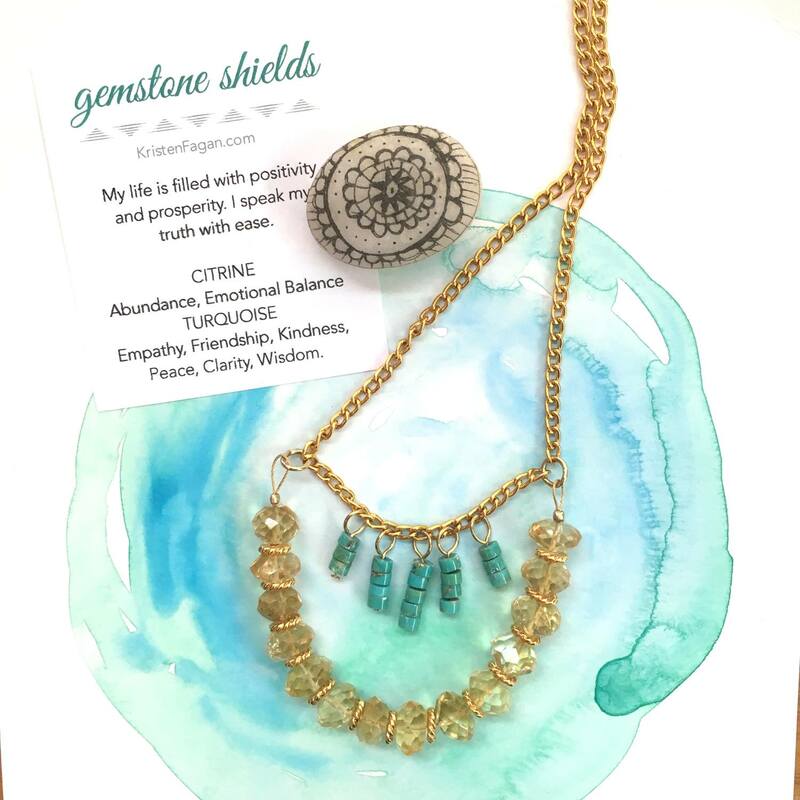 Worn for protection, centering, healing and strength as well as better concentration, confidence and an overall composure. Protects you from stress and energy drains. These are one of a kind, gift one to a fierce woman in your life or grab one for yourself today. Live in your strength. 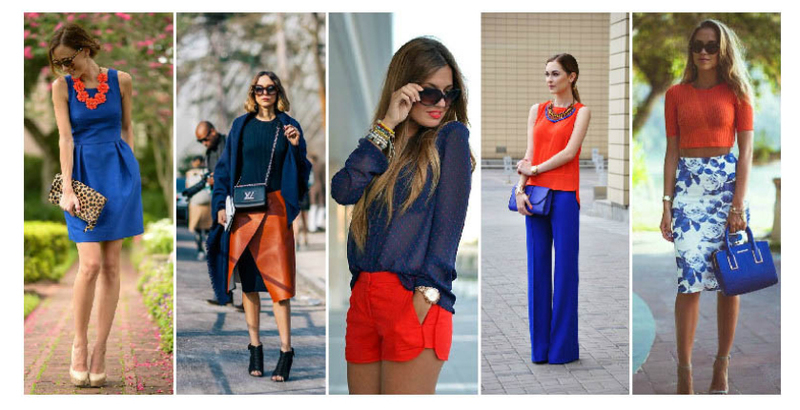 Style is saying something without speaking a word. ~ Rachel Zoe. For sales through Saturday, December 5th, I’m offering a 15/10 deal – 15% off discount on handmade jewelry and 10% of the sale will be donated to UMOM New Day Centers. Use the coupon code GOODKARMA at checkout to redeem your discount. Offer is exclusively for my handmade jewelry section. GOOD KARMA SALE! What’s that? It’s a chance to make the holidays meaningful + spread good karma! 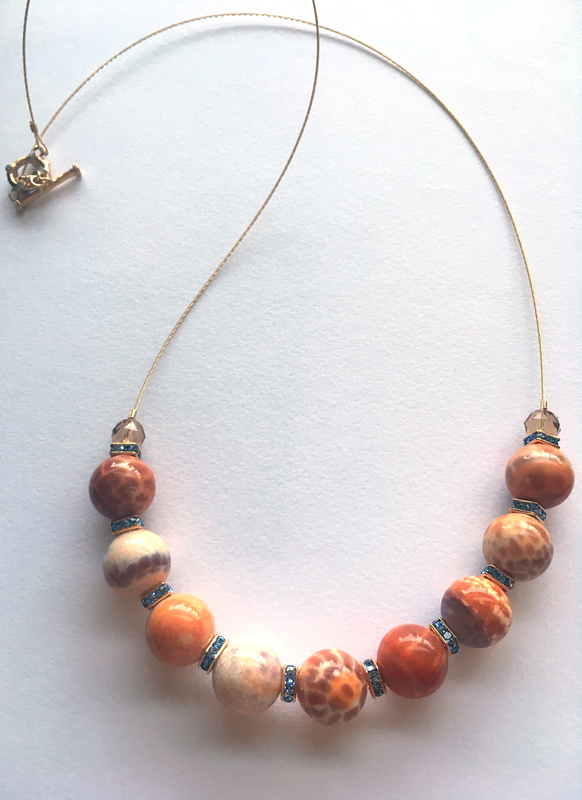 For sales through Saturday 12/5, I’m offering a 15/10 deal – 15% off discount on handmade jewelry and 10% of the sale will be donated to UMOM New Day Centers. Use the coupon code GOODKARMA at checkout to redeem your discount. Offer is exclusively for my handmade jewelry section. UMOM New Day Centers, located in Phoenix, Arizona, provide safe shelter, housing and supportive services to homeless families in need. They keep families together and provide care from emergency shelter to transitional housing and finally, permanent, affordable housing.